Announcing MLB's 2016 Umpire Crew roster: 19 Crews & 75 Umpires, which is a change of -1 umpire from the 2015 iteration. 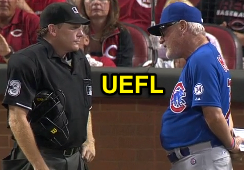 Visit the UEFL's Umpire Roster and Profiles page for a sortable list of all MLB and MiLB call-up umpires (MLB umpires may be sorted by 2016 Crew). This is an unofficial early release of the 2016 MLB Umpire Crews and is subject to change prior to or during the regular season due to vacation, injury, or other events. Procedures for registering for the 2016 UEFL season will be released in early February: Stay tuned! Crew 3 17 Hirschbeck, John 52 Welke, Bill 19 Carapazza, Vic 70 Reyburn, D.J. ≫ Paul Schrieber is not listed on the MLB Umpire Crew list/staff. He did not work the 2015 postseason, but did officiate the 2015 All-Star Game as the second base umpire. ≫ Tim Welke has not been assigned to a crew, but remains a Crew Chief. ≫ Mike Everitt leads Crew 19 as an interim/acting crew chief (Everitt was on Welke's crew in 2015). ≫ Because of this movement, there are 75 Umpires listed on the Crew list and two Umpire 4 slots available for Call-Up Umpires from AAA baseball. There were 76 umpires and no permanent fill-ins in 2015. ≫ From Umpire 2 To Interim or Acting Crew Chief: Mike Everitt. ≫ From Umpire 3 to Umpire 2 (Backup Crew Chief): Sam Holbrook, Marvin Hudson, Tony Randazzo. ≫ From Umpire 4 to Umpire 3: Vic Carapazza, James Hoye. ≫ From Umpire 2 to Umpire 3: Doug Eddings, Paul Nauert.